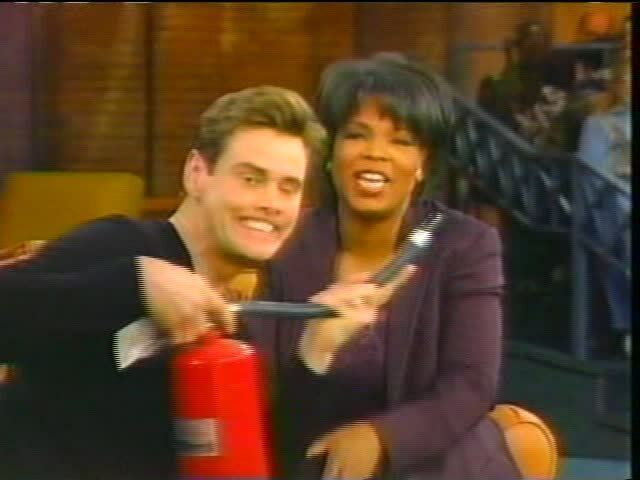 Jim Carrey made an appearance on The Oprah Winfrey Show in February 1997 to promote his new comedy "Liar Liar". He made an entry with the fire extinguisher in his hand. He also made some comments on his fan about how he looks like pop of blood vessel. Oprah discussed the bathroom scene from "Liar Liar" with Jim and then further about the story. Then Jim showed 'The Claw act' which his father used to do to him. Oprah asked Jim how it does feel to be him right now and she said that whe would not ask about money. He also that it feels really enjoying to be him as he likes meeting people. He also told a story about Lauren and him in a restaurant. Some fans took them to the lobby and they felt that they have become like knick-knacks. Fans were kicking and saying that they made contact. Jim said that he feels sorry for anyone who makes success in a small time. He further talked about his stand-up comedy days and how nervous he used to feel about how audience would respond. Oprah also as him whether he feels that he is out on the edge to which he replied that when he bombed, he decided to bomb worse than anyone who has ever bombed. Some clips were showed of his upcoming movie "Liar Liar". He was asked about expectations of people about him now that he is a star. And if he thought "The Cable Guy" was a little dark? Jim agreed saying that he wants to come up with different things and he does think that even "Liar Liar" is different. He loved the idea of a lawyer who can't lie. He liked the script. Blue prints of "Liar Liar" were shown further in the show. Jim made a face saying "I never make mistakes." Jim said he liked to do perfect takes. He thinks about ways to make it different while shooting scenes. He makes faces in the mirror to practice. Jim further explained that he has a recognizable face and posture. He tried disguising himself once. His make-up artist gave him a mustache and gum. He went with daughter to LA and wore glasses and a baseball cap. He went to the t-shirt shop and wanted a large size t-shirt and another one for his daughter. A man was giving a look which was strange and he called others that its Jim. Then, Jim sang a song for the audience. He talked about how Lauren live with him all the time to which he replied that she out-talks him and he exhausts himself. They have a deal when she talks too much, he is allowed to interrupt. Before going on a commercial break, Oprah leans down on sofa and Jim leans on her lap. After the break Oprah asked Jim when he met Jimmy Stewart? Jim said that he met him at a Church. Jimmy stumbled once when he was reading as he saw Jim's wide open face. Jim became like a man to friend and beast. He met Jimmy and embarrassed him because he gave more importance to him than God. It was like John the baptist met Jesus. Jim said, "You can have no idols...except the Oscars!!" Jim Carrey further joked that he knew that he was talented right away when he was born. As soon as he came out, he was making origami when umbilical cord was cut out. When he was a kid, he put up shows in the house basement. His childhood picture was shown on the screen. He made his sick mom feel better by playing praying mantice. He also visualized a lot about his success when he had nothing at that time. He wrote himself a check for 10 million dollars for acting services rendered and dated it Thanksgiving 1995. Ironically, he was offered 10 million dollars for "Dumb & Dumber". He put that cheque in his father's casket as it was his dream too. He also said that he was the white guy in the sketch show "In Living Color" and he was okay with it as the director let him bring his own creativity. His fave character was Vera De Milo. His best work on it was 'Hunting Elvis' and Fire Marshal Bill. Oprah showed that he made it to People Magazine's list of best dressed celebrities in 1996. She talked about Jim's marriage and he showed her his ring. Jim told her that they drove up the coast looking for a spot to get married. Jim further talked about him and Lauren as a couple. They are very simple people. Then Oprah talked about "The Mask". She asked him about his fave designer to which Jim replied that its Armani and Hugo Boss. She also talked about him being at bowls game. Saturday Night Live clip was shown and Jim was laughing loudly saying that that's why he can't watch himself. Then, he met his impersonator in the audience. He read out some questions from the audience and pretended that he cannot read. Some of the questions were "Do you improvise much? Was it real tears in the scene with Max in "Liar Liar"? Can you do that thing you always do with your mouth? Does your wife gets ever annoyed by you? What do you think of your career plans?" Jim further showed some of his favorite impressions of other famous people. He also told that he likes to spend time with his daughter. Then, Lauren gave a surprise visit on the show. Lauren said that he does not annoy her. Oprah asked her what it is like living in a house with him? Lauren replied that he is not allowed to do impressions as it makes her scared. She was also asked how he did woo her? Lauren replied that he is very romantic and give flowers, sing, etc.